Spurred on by the results of the last presidential election, women across the country are taking action by running for office, and Jacksonville is no exception! 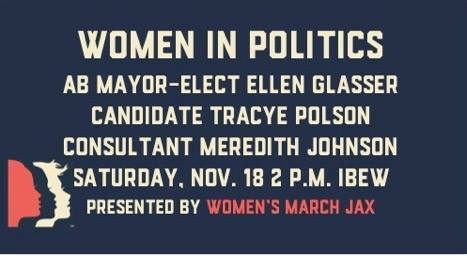 Join Women’s March Jax to hear more about the trends in politics, what it’s like to run for office (and win!) and what our local female politicians are doing to change the direction of our local and state governments. **Meredith O’Malley Johnson, Political Consultant, who will update us on the trends for women in politics and the millenial view of the new world before us. We’ll also provide tables with legislative updates on the issues that concern our issue captains in the coming legislative season. Get educated, write postcards, and raise your voice! We will close with a call to action, including: Keep getting involved, keep advocating for our rights and issues, and keep running for office: women’s leadership in politics (from all generations!) is needed now more than ever! Please attend this important event that schowcases how the world really has changed since the election…and how we can continue to make a huge difference in the world the more we get involved.